A new Medicare report found that U.S. hospital employees are failing to report the majority of medical errors they make or observe. 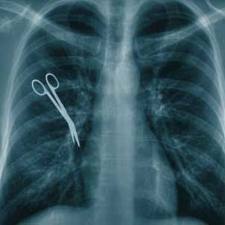 The report found only one out of seven medical errors and adverse events are being reported. In these cases, hospitals investigated, but often made no change to prevent future medical errors. The report was issued today by the inspector general of the Department of Health and Human Services. In reviewing 293 cases in which patients had been harmed, the inspector general found 40 cases were reported to hospital managers and 28 were investigated by hospitals. Only five cases prompted change. The inspector general estimated more than 130,000 Medicare beneficiaries experienced one or more adverse events or medical errors in hospitals in one month. excessive bleeding linked to blood thinner, severe bedsores and overuse of painkillers. Other adverse events at hospitals may include surgical errors, birth injuries and failure to respond to a hospital alarm. The review found that many hospital employees were fearful about reporting medical errors after the Institute of Medicine’s 1999 landmark report, which estimated up to 98,000 people die in U.S. hospitals each year from preventable medical errors. But here, employees often failed to recognize what constitutes patient harm, did not realize patients were harmed or assumed someone else would report it. In some cases, employees thought the mistake was so common it did not require reporting. In recent years, hospitals have been required to track medical errors and adverse patient events as part of their Medicare contract. At least 27 states, including Massachusetts, have implemented laws for mandated reporting of healthcare errors. Following the inspector general’s report, Medicare officials plan to develop a list of “reportable events” for hospitals and employees. Hospitals are also being asked to give employees their own instructions. Click for a New York TImes article about this review. Click for a review of state reporting laws from the National Conference of State Legislatures. The Boston medical error lawyers at Breakstone, White & Gluck specialize in medical malpractice cases involving injuries at Massachusetts hospitals and healthcare centers. If you have been injured, it is important to contact an experienced attorney. To learn your rights, call us today at 800-379-1244, 617-723-7676 or use our contact form.